Rock ‘n’ roll has its roots in the music of the Mississippi Delta and Blues and R&B artists such as B.B. King, Robert Johnson, Muddy Waters, and Ike Turner. The Graceland Excursions Mississippi Delta Blues Tour will trace the influences that inspired the creation of rock ‘n’ roll music. Expert tour guides will narrate this day-long musical adventure that explores the deep roots of blues culture and history – and allows you to discover the delicious foods of the Mississippi Delta. 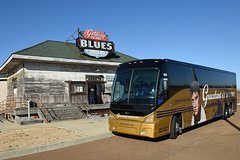 Enjoy this 9-hour guided excursion from Graceland in Memphis to the Mississippi Delta with provided on-board entertainment as you travel by luxury motorcoach to each musical landmark and museum. Notable stops along the tour include Gateway to the Blues Museum, Delta Blues Museum, GRAMMY Museum® Mississippi, Southern Sounds at Dockery Farms, and Ground Zero Blues Club in Clarksdale for lunch on your own. Elvis Presley’s musical roots, including the influences that inspired Elvis and other artists to begin mixing blues, country, gospel and R&B to create an entirely new sound – dubbed rock ‘n’ roll – which was brought to life in Memphis over 60 years ago.
. This historic site is where musicians invented the blues genre around the turn of the 20th century. It’s a mecca to blues enthusiasts and the home to Charley Patton, the "Father of the Blues." Trace the influences that inspired the creation of rock 'n' roll with The Graceland Mississippi Delta Blues Tour, guarantee your seat on this popular day trip from Graceland in Memphis by booking ahead today.